Sometimes you need to squeeze a railroad into a very small space. Your living quarters may not have room for trains that go in circles. Or maybe you want to add a train to a Christmas village or other display where there isn't a lot of room. Or maybe you just want to add a little more interest to an existing railroad. Fortunately there are many good solutions for sending short "trains" (especially one-piece units like streetcars) back and forth, and some are pretty easy to set up and run. Usually, products designed to help you do this easily are called "reversing systems." Unfortunately that terminology occasionally "leaks over" into a different kind of setup - the "reverse loop," a system that allows your train to go into a loop at the end of a mainline, and without stopping, turn around and come out onto the mainline. We'll have a bit more to say about reversing loops below, but this article is about streetcars or short trains that go back and forth without ever turning around. Another related technology is the "bump and go" system installed on certain trains (usually streetcars) that makes them reverse automatically whenever they run into something. If one is available in the scale you model, and you don't mind having only one "train" to run, that may be an easy solution for you. (We say more about those further down, too.) But if you want some choice in which trains you have going back and forth, you will need a solution that affects the track current, and not just the train. No matter what kind of electric trains you're running, there are certain common components to all reversing systems. Power Supply - Your trains have to get electricity from somewhere. Most reversing systems go between your power supply and the track - they don't supply the power, they just control how it is delivered to the track. But a few systems include a power supply or provide a special power supply that has the reversing technology built right into it. Track - Your track is either logically or physically divided into three sections - a mainline and two stopping zones, one at either end. Each stopping zone should, ideally, be long enough to hold as long a train as you plan to run. So if your "back-and-forth" railroad is going to be 100" long, you probably shouldn't plan on running trains that are 50" long. A few systems require a gap in the rails between the stopping zone and the mainline. Sensors - Sensors let the reversing circuit know that the train is safely in a stopping zone, so it can stop the train, reverse the voltage (for DC trains) and start it up again. Bumpers that sent a pulse or other signal to the reversing circuit when something smashed into them. 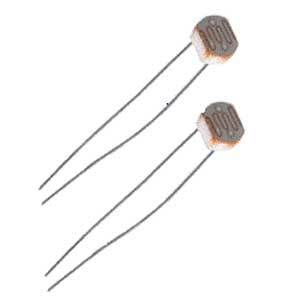 Each sensor usually required two wires going back to the reversing circuit. On modern systems the sensors may be replaced by other technology that enables the reversing circuit to sense when the train is in a stopping zone (using voltage drops, resistance drops, etc.). Usually this sort of system requires a gap in the track between the stopping zone and the mainline, plus some electronic component, like a diode, installed at that point. It's also worth noting that you need some sort of train, preferably short or very short. Because streetcars are notorious for back-and-forth operation, they're the most obvious choice. But some folks like to run short industrial trains, like a four-wheel switcher and three little ore cars or the like. 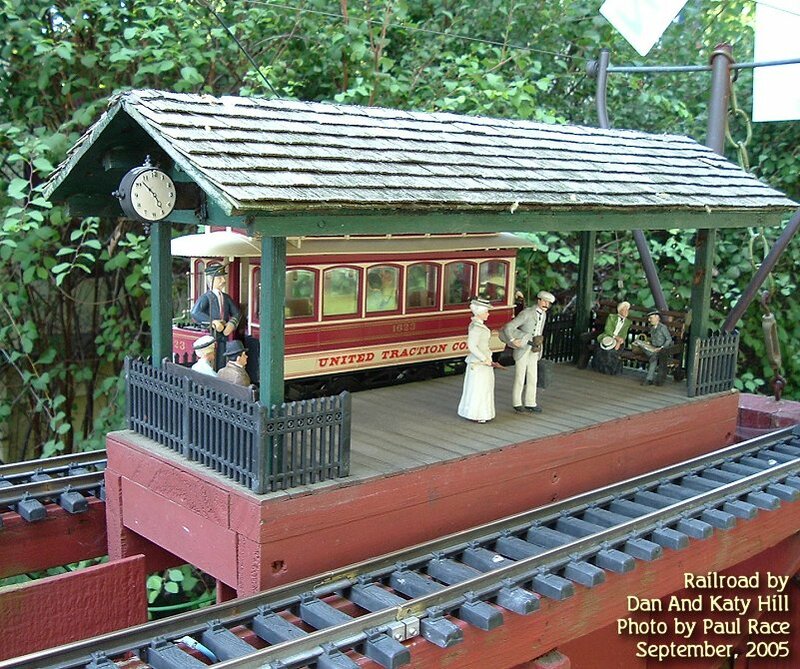 Back when most model railroaders were good with soldering irons and acquainted with circuit-boards, auto-reversing in indoor scales used to be considered a fun do-it-yourself project. Today, fortunately, several companies are trying to take the work out of it, but using technology based on those early systems. 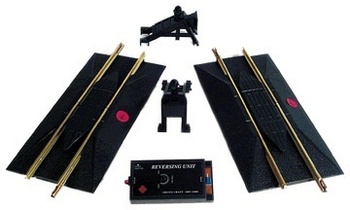 These "traditional" indoor autoreversing mechanisms are represented by Circuitron's AR-1 and AR-2, which use photo cells to determine when a train is in the stopping zone. The difference is that AR-2 allows you to have delays at the end of the railroad, so you can assume your train or streetcar is stopping for passengers or mail. Circuitron reversing units use little optic sensors to determine when the train is on each end of the railroad - a technology that dates back some sixty years, but still works. In fact, the Circuitron wiring diagram looks a lot like the generic diagram above. Such systems don't require special track, and installation is relatively simple, especially if you're not afraid of soldering wires to terminals or other simple soldering. 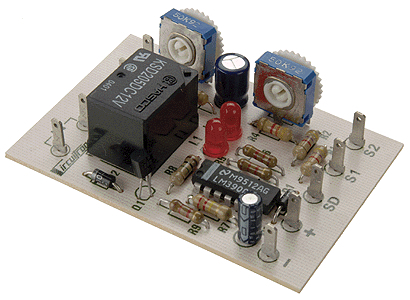 Because you don't need special track or power supplies, systems like this are relatively inexpensive. We don't have a recommended retailer for the Circuitron products, but any hobby shop can get them through Walthers, and many online stores carry them. 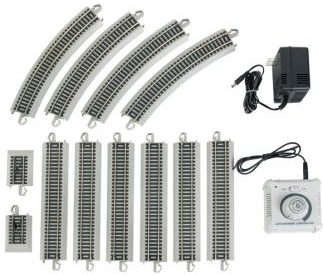 An alternative supplier of similar products is Dallee Electronics, who offers six different "Automatic Back-N-Forth" products for DC trains. Again, we don't have a recommended retailer, but this should give you alternatives. Though we mention Large Scale, you might be able to find better solutions to use this outside. Even if you take steps to protect the circuit board, things like maple "helicopters," etc. can easily confuse the optic sensors. Fortunately some systems have been specifically designed for Large Scale outside (below). For several years Bachmann, has been packaging HO and On30 sets that have a streetcar, special track, and the autoreversing mechanism built right into the setup - that's shown later. Recently, in response to customer demands, Bachmann packaged a system that includes everything you need to set up a small back-and-forth railroad (except the train), with the option to buy more (special) track and extend your empire. On the Bachmann system, the sensors and the extra wiring are built right into the track. For that reason, you have to buy special track to make your railroad longer, but it makes the installation just about idiot-proof, which definitely works for me. The train typically stops for 5 to 7 seconds at each end of the line - long enough to pretend your conductor is picking up a mail bag or whatever. Because this setup includes the track and power supply, this set costs substantially more than systems like the Circuitron system above. But if circuit boards scare you and you want to get a back-and-forth railroad operating in about a half-hour, this may be the way to go. At the moment, one of Amazon's links to this product actually lists the Bradford Exchange/Hawthorne Village web page. If you want to go right to the Bradford Exchange site and take advantage of their 1-year satisfaction warranty, click on the button to the right. To see Amazon's listing for additional Curved Reversing Track to extend your mainline (#44549) please click on the button to the right. To see Bachmann sets that come with little streetcars so you have everything you need in one box, scroll down. If you're a garden railroader, your best bet for an auto-reversing system may be AristoCraft's system, which is hard to come by, but still one of the best made. Aristo sold this in two versions - first, in a relatively idiot-proof version that included specially-wired "rerailer/grade crossing" track pieces, and another system that included the electronics, and instructions for using it with track you already own. Personally I liked the more idiot-proof version better, but the cost of the brass track made that system too expensive for some hobbyists. Sadly, both systems are hard to come by, and I'm not sure Aristo will be making any more. The AristoCraft system uses electronic sensing, so additional wires are not required, which is especially helpful out of doors. I have been told that LGB used to make a similar system, but I have not seen one in a very long time. LGB's "Reversing Loop" system was very popular, but that's not the same thing. If you can't get a system built for outdoors, you might try the Circuitron solution and figure out how to protect the circuit-board. Amazon is out of stock, but to see their listing for the AristoCraft solution, click on the button to the right. Reversing the track polarity on AC-powered trains doesn't work, since track polarity doesn't affect train direction. What has been tried a few times are systems that sense when the train is in a stopping zone, cut the power, wait a second, and turn the power back on, but leaving the polarity alone. So a circuit that turns the power off, on, off, on every time the train hits a stopping zone would do the job. Systems to do this have been tried. But, unfortunately, if anything goes wrong, say it gets out of cycle, the locomotive could wind up going into the bumper and spinning its wheels until the motor burns out. Which means you might want to keep a slightly closer eye on this kind of setup than you would a DC back-and-forth setup. Or skip the hassle and buy an O gauge train or trolley with bump-and-go reversing mechanisms built right in (see below). I haven't tried any commercial product for this (nor have I found a link to any good do-it-yourself versions). Dallee Electronics has some solutions that might be effective, but they recommend that you replace the Lionel reversing unit in the locomotive itself in addition to buying the unit that cuts and restores the power. If you have experience with back-and-forth AC railroads, please contact us and let us know your experiences. This topic is out of scope for this article, but it's worth bringing up because there is a lot of confusion about the difference between "reversing units" and "reversing loop units." Unlike a straight back-and-forth setup, a reversing loop actually include a loop of track that the train runs around and comes out of in the opposite direction. This is a "piece of cake" in 3-rail systems, because the outside rails run into other outside rails and the inside rail runs into an inside rail. However, it is tricky in two-rail systems, because the outside rail runs right into the inside rail, causing a dead short if you don't take special measures. A "reversing loop" on a DC railroad includes gaps in the rails between the loop and the mainline, as well as an electronic circuit that senses when the train is completely on the loop so it can change the polarity on the mainline before the train heads out of the loop again. There are actually more systems for this than there are for straight back-and-forth setups, so if you google "reverse loop HO" or whatever, you're very likely to find something you can use. On the other hand, if you had room for a reversing loop, you probably wouldn't be reading this article so we're going to move on to our next topic: Bump-and-go trains. Since streetcars are expected to go back and forth, it is only natural that some providers have put reversing mechanisms right into the streetcar bumpers. In fact, the first Bachmann On30 auto-reversing streetcar set - built for Dept. 52 - worked this way. The "down side" of bump-and-go technology is that the poor motor is forced to go from "full speed" one way to "full speed" the other direction. This takes a toll on motors that are not designed specifically for such operation. In some cases, it even takes a toll on the structure of the locomotive/trolley. Dept. 56's Bump-and-Go Streetcars - Bachmann made the first On30 streetcar that was ever mass-produced, under contract with Dept. 56. 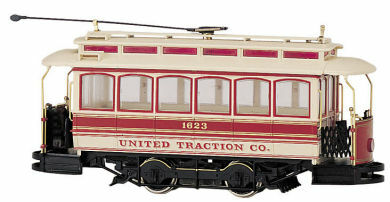 After that contract ran down, Bachmann made similar streetcars under their own name, shown below. But for their "own" products, Bachmann replaced the "bump-and-go" streetcars with a special track system that depended upon sensors instead of collisions - they offer a lifetime warranty on their products, and the lifetime of the "bump-and-go" streetcars were not what they ought to have been. If you have one of the original Dept. 56 bump-and-go streetcars, be gentle with it. They are irreplaceable, even though Bachmann is still in business. If you want to run it, get one of the new Bachmann 0n30 sets (below) and run the Dept. 56 streetcar on it (letting the electronics do the work instead of the bumpers). Because, sadly, if you send a beat-up bump-and-go Dept. 56 streetcar back to Bachmann, they no longer have parts to fix it. The way their warranty works, they will send you an "equivalent" new or refurbished product that will be very attractive, but it will NOT be bump-and-go, and it will NOT have the Dept. 56 paint job. In subsequent years, Dept. 56 contracted with another supplier to provide an autoreversing set that featured a blue streetcar. It was a different design by a different manufacturer but also used bump-and-go technology. 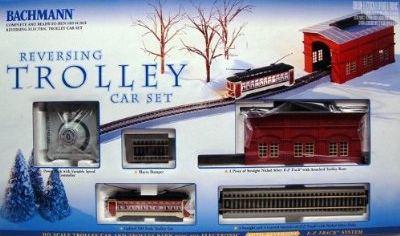 Again, this is appropriate for use with either a holiday village or with O scale accessories. I'm told that it was introduced in 2004 and retired in 2008, but it does not seem to have sold in the same quantities as the first Bachmann-made version. By the way, if you have one of these, please contact us and share your experiences with it. Unlike the Bachmann bump-and-go setup, which was a bit too delicate for continuous collisions, the MTH O-27 "Trolleys" are built to handle that kind of operation. Like most postwar O or O-27 trains, they have built-in reversing mechanisms that are ordinarily triggered by turning the track power on and off. But they also have switches on their bumpers so they will reverse if they run into anything. These streetcars actually come with a circle of track and a little transformer - everything you need to make a little loop RR. But they also have bump-and-go technology built-in, so with a couple of track bumpers (purchased separately), these streetcars will go back and forth indefinitely. MTH has made this available in several color schemes. At the moment, a Christmas-themed and an M&M-themed version are available through Amazon, though other retailers may have less seasonal paint jobs. 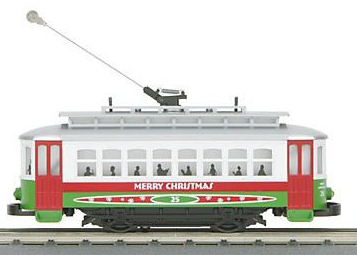 To see the Amazon listing for the Christmas-themed MTH O-27 autoreversing streetcar setup, click the button on the right. 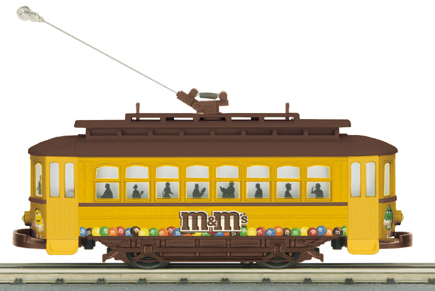 To see the Amazon listing for the M&M-themed MTH O-27 autoreversing streetcar setup, click the button on the right. After their contract with Dept. 56 expired, Bachmann redesigned their auto-reversing streetcar system to go to electronic switching instead of bump-and-go, which was too hard on the little streetcars. By going to an electronic solution, Bachmann also made it possible to use different streetcars and locomotives with the same auto-reversing setup. For that reason, Bachmann has made several different versions of the streetcar off and on. Update for September, 2012 - Although I usually link to this sort of set on Amazon for covenience, at least one of the sets below has become unavailable on Amazon since I started writing this article. I'll continue to leave the links and descriptions online, since they may come back into stock later, or you may be able to find them at another retailer site. But in the meantime, please consider this a really big hint that you shouldn't wait too long. The On30 streetcar is exactly the same size as the Dept. 56 streetcar. Bachmann has made Christmas and non-Christmas versions of the set, although the non-Christmas set actually uses the same colors as one of Bachmann's original On30 Christmas train sets, so you don't really have to buy one of each. This is the streetcar that comes with the 'non-Christmas' version of the Bachmann On30 auto-reversing set. This is the streetcar that comes with the Christmas version of the Bachmann On30 auto-reversing set. You may notice that the red and green change places on the Christmas version of the car, something that occasionally happens on Bachmann's other Christmas trains. Unless you find one of these in a store, I can't guarantee which version you'll get when you order one online. That never bothered me, and I hope it doesn't bother you. In addition, Bachmann has produced the same streetcar separately in several other "paint jobs" that work just as well on the autorversing system, in case you want to have some variety. In fact, any small locomotive should work, including HO locomotives and streetcars. Frankly, if you have a holiday village, and you don't already have an investment in trains, this is the system you should probably buy. But it isn't the only system that will work for you. For HO railroaders, Bachmann has made a version that comes with an HO streetcar. However, these are currently in very short supply. We'll post any links that we do find, but Amazon is out at the moment, which usually means that most other suppliers are out or nearly out as well. As silly as this may sound, study the picture carefully, and you'll see that the streetcar and the barn are both shaped differently from the On30 set. I point this out because the On30 set is often labeled as "HO" because they use the same track. If you really need HO (for example, you operate an HO railroad and you're worried about clearance issues if you try to put something with the profile of a Lionel coach on your railroad), hold out for the HO version. Or buy the On30 or track-only version, install it, and run ANY HO streetcar on it. HO or On30 (On30 recommended for Christmas Villages) Bachmann AutoReversing Set Very easy to set up; allows you to use any short locomotive. Bachmann AutoReversing On30 Streetcar set Simple setup, everything is included, even the streetcar. Amazon is currently out, but they've had them in the past and may have them again. Sorry, no recommended retailer at this time. Bachmann AutoReversing On30 Christmas Streetcar set Simple setup, everything is included, even the streetcar. Recommended for Holiday villages. Bachmann AutoReversing HO Streetcar set Simple setup, everything is included, even the streetcar. Circuitron or Dallee Solutions Hold the cost down by using track you already own. Sorry, no recommended retailer at this time. Large Scale (Garden Trains) (For outdoor or display railroads) AristoCraft Reversing Mechanism Though hard to find, this is very simple to use; you can use track and a power supply you already own. Circuitron or Dallee Solutions If you use any of these outside, you'll have to take steps to protect the circuit board from the elements. Sorry, no recommended retailer at this time. When I started this article, I was thinking that it would probably be pretty short, recommending currently available products for most situation. But several common situations had no single "perfect" solution, so the article kept growing. I hope you can find the information you need, or at least get pointed in the right direction. If I get it set up, I'll try to post photos here. In the meantime, it's become apparent that there are still gaps between what people want to do and what you can buy to solve the problem. Please contact us with your own experiences, suggestions, corrections, photos, etc. Photos are always great, too. And, above all, enjoy your trains and any time you have to spend with your family in the coming weeks.